Kubo shunman was a pupil of Kitao Shigemasa (1739-1820) and produced relaxed and elegant colour prints influenced by Kiyonaga. He was particularly adept at the use of muted colour schemes (benigirai) in the time when the government passed sumptuary regulations during the Tenmei and Kansei periods (1781-1800) forbidding the use of bright colours. 'The six jewel river' is one of the finest works by Shunman. The six rivers are all in different areas of Japan but Shunman’s six rivers from the Mutamagawa series is shown here as a continuous image. 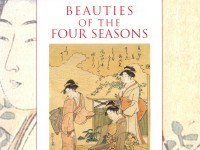 The collection of the Ashmolean Museum lacks the fifth image, that of Ogi of Shiga. This print is Noji no Tamagawa (the Jewel River of Noji, also known as the Jewel River of Hagi). 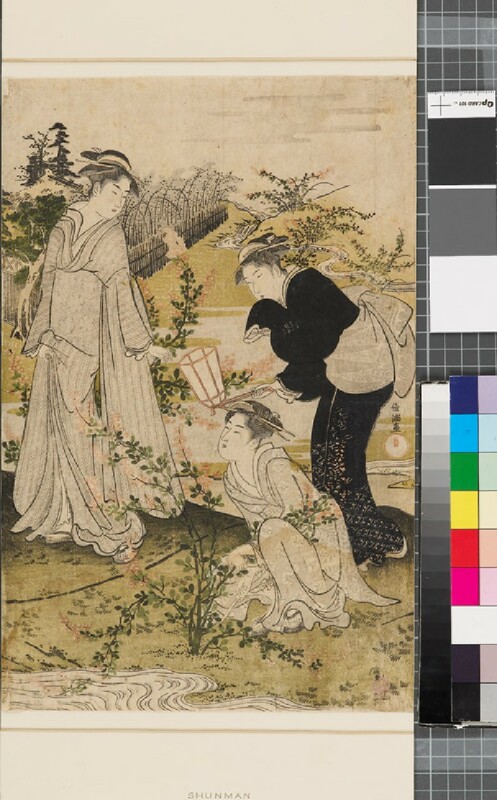 A standing beauty looks at her maid who is cutting a sprig from a hagi bush, while the other girl holds a lantern. In the sky, the moon appears among the clouds. This river is known for its clear water and the hagi that surround it, and many poems have been written about this river, associated with hagi. There is for example a famous poem by Minamoto no Toshiyori (c. 1055-1129), ('Let us come back tomorrow to the river of Noji. The waves which flow over the hagi branches beside the river bank reflect the moonlight').